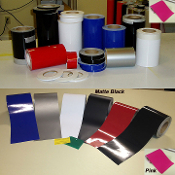 Our full 150 foot rolls of 3m brand vinyl striping are available in 1", 2", 3"and 4" on this page. We use 3m Series 50 Scotch Cal Vinyl. This is an intermediate 6 year outdoor film that can be used for a variety of striping applications. These applications include striping on automobiles, boats, trailers, motorcycles, bikes, sign borders, buildings and more. We currently carry Black, Matte Black, Silver, White, Blue, Pink and Red.